The healthcare payments industry is growing at a rapid pace; however, 25 to 40 cents of every healthcare dollar is spent on administrative expenses. These costs are only poised to increase as changes due to reform and consumerism continue to reshape the industry – impacting the way billing services do business. Data from Instamed's 2013 Trends in Healthcare Payments Annual Report includes quantitative data from over $85 billion in healthcare payments on the InstaMed network, and confirms that the healthcare payments industry is evolving; it outlines how healthcare payors and providers can manage these changes. In particular, growth in consumer responsibility and the shift in payment methods will be crucial areas to increase focus. Below are trends featured in the report and best practices for billing services to prepare for the future. Sixty-seven percent of providers indicated that they saw an increase in patient responsibility. A decade ago, payors and employers managed almost all of the health benefit decisions for patients. As a result, patients were relatively insensitive to costs as they took care of their healthcare needs. However, today, patients have higher deductibles (over 15.5 million have high-deductible health plans) and have become consumers who are sensitive to their healthcare costs. Seventy-six percent of providers said that it took more than one month to collect from a patient. Trends in healthcare payments show that the increase in consumer responsibility is accelerating, but many healthcare providers and their billing companies still rely on paper-based, manual payment collection and posting processes. Furthermore, consumers expect to pay healthcare bills when and how they choose, as they do for other bills. As a result, healthcare providers and their billers are spending more money and more time to collect, yet are still accumulating a large amount of bad debt. Seventy-nine percent of patients said that they would prefer to pay online through their provider or health plan website. Consumers want to manage, pay, and understand their healthcare finances in one convenient place. To resolve collection issues and meet the needs of consumers, billing services must work with healthcare providers and payors to help consumers take control of their healthcare payments by delivering simple, online solutions. 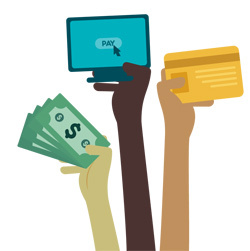 Fifty-five percent of patients said that they normally paid their monthly bills online, and 24 percent said that they paid those bills via their bank's bill pay portal. A growing number of consumers now pay household bills using their bank's bill pay portal, so they can easily manage all of their bills in one place. By enabling consumers to pay their healthcare bills this way, billing services reach consumers where they are already accustomed to paying, which improves the ability to collect patient payments and simplifies the healthcare payments process. Seventy-eight percent of providers indicated that they typically mailed more than one paper statement to collect a patient payment. In today's healthcare landscape, billing services must operate more efficiently to keep administrative costs low and collect a higher amount from consumers. Many industry experts believe that the recent influx of data and analytics due to innovation in healthcare technology, or Big Data, will give all healthcare organizations the ability to navigate the changes. Seventy-two percent of patients said that they did not know their payment responsibility following a visit. When you stay at a hotel, are you able to check in without giving your payment card? Of course not. However, consumers receive access to healthcare services with no assurance that they will pay their portion of the bill on time, or at all. Billing services have opportunities to use Big Data and technology to accurately estimate responsibility and automatically collect payments, which creates a level of payment assurance already achieved in consumer-focused industries. Seventy-six percent of providers said that they offered the option of payment plans to their patients. As billing services and their clients increasingly rely on consumer payments for revenue, many have started to use more consumer-centered strategies, like payment plans, to collect payments. However, they will need to implement best practices and policies – including automating payments and communications, and ensuring payment data is secure – to improve efficiency. Bill Marvin has been in the revenue cycle industry since 1993 and is the president and CEO of InstaMed, the leading Healthcare Payments Network.